I understand that there is a resource hit from using RTTI, but how big is it? Everywhere I've looked just says that "RTTI is expensive," but none of them actually give any benchmarks or quantitative data reguarding memory, processor time, or speed. So, just how expensive is RTTI? I might use it on an embedded system where I have only 4MB of RAM, so every bit counts. Edit: As per S. Lott's answer, it would be better if I include what I'm actually doing. I am using a class to pass in data of different lengths and that can perform different actions, so it would be difficult to do this using only virtual functions. It seems that using a few dynamic_casts could remedy this problem by allowing the different derived classes to be passed through the different levels yet still allow them to act completely differently. From my understanding, dynamic_cast uses RTTI, so I was wondering how feasable it would be to use on a limited system. The former involves only one comparison of std::type_info; the latter necessarily involves traversing an inheritance tree plus comparisons. Past that ... like everyone says, the resource usage is implementation specific. I agree with everyone else's comments that the submitter should avoid RTTI for design reasons. However, there are good reasons to use RTTI (mainly because of boost::any). That in mind, it's useful to know its actual resource usage in common implementations. I recently did a bunch of research into RTTI in GCC. tl;dr: RTTI in GCC uses negligible space and typeid(a) == typeid(b) is very fast, on many platforms (Linux, BSD and maybe embedded platforms, but not mingw32). If you know you'll always be on a blessed platform, RTTI is very close to free. GCC prefers to use a particular "vendor-neutral" C++ ABI, and always uses this ABI for Linux and BSD targets. For platforms that support this ABI and also weak linkage, typeid() returns a consistent and unique object for each type, even across dynamic linking boundaries. You can test &typeid(a) == &typeid(b), or just rely on the fact that the portable test typeid(a) == typeid(b) does actually just compare a pointer internally. In GCC's preferred ABI, a class vtable always holds a pointer to a per-type RTTI structure, though it might not be used. So a typeid() call itself should only cost as much as any other vtable lookup (the same as calling a virtual member function), and RTTI support shouldn't use any extra space for each object. From what I can make out, the RTTI structures used by GCC (these are all the subclasses of std::type_info) only hold a few bytes for each type, aside from the name. It isn't clear to me whether the names are present in the output code even with -fno-rtti. Either way, the change in size of the compiled binary should reflect the change in runtime memory usage. A quick experiment (using GCC 4.4.3 on Ubuntu 10.04 64-bit) shows that -fno-rtti actually increases the binary size of a simple test program by a few hundred bytes. This happens consistently across combinations of -g and -O3. I'm not sure why the size would increase; one possibility is that GCC's STL code behaves differently without RTTI (since exceptions won't work). Known as the Itanium C++ ABI, documented at http://www.codesourcery.com/public/cxx-abi/abi.html. The names are horribly confusing: the name refers to the original development architecture, though the ABI specification works on lots of architectures including i686/x86_64. Comments in GCC's internal source and STL code refer to Itanium as the "new" ABI in contrast to the "old" one they used before. Worse, the "new"/Itanium ABI refers to all versions available through -fabi-version; the "old" ABI predated this versioning. GCC adopted the Itanium/versioned/"new" ABI in version 3.0; the "old" ABI was used in 2.95 and earlier, if I am reading their changelogs correctly. I couldn't find any resource listing std::type_info object stability by platform. For compilers I had access to, I used the following: echo "#include <typeinfo>" | gcc -E -dM -x c++ -c - | grep GXX_MERGED_TYPEINFO_NAMES. This macro controls the behavior of operator== for std::type_info in GCC's STL, as of GCC 3.0. I did find that mingw32-gcc obeys the Windows C++ ABI, where std::type_info objects aren't unique for a type across DLLs; typeid(a) == typeid(b) calls strcmp under the covers. I speculate that on single-program embedded targets like AVR, where there is no code to link against, std::type_info objects are always stable. Perhaps these figures would help. GCC Clock() + XCode's Profiler. 2 x 2.66 GHz Dual-Core Intel Xeon. The class in question is derived from a single base class. 5 is just my actual code, as I needed to create an object of that type before checking if it is similar to one I already have. 5) 14,261,000 Ticks (~23 Seconds) - typeid() with extra variable allocations. 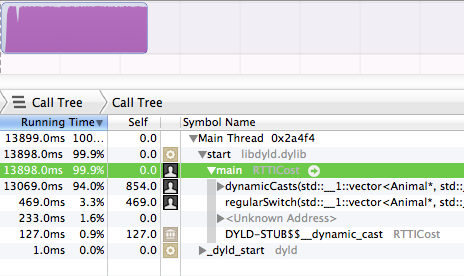 For simple cast cases without optimisation typeid() is more than twice faster than dyncamic_cast. On a modern machine the difference between the two is about 1 nanosecond (a millionth of a millisecond). 5)     75,000 Ticks - typeid() with extra variable allocations. 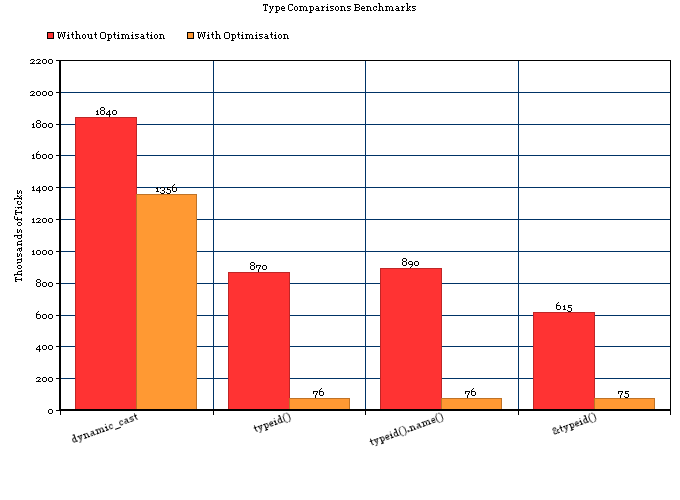 For simple cast cases with optimisation, typeid() is nearly x20 faster than dyncamic_cast. As requested in the comments, the code is below (a bit messy, but works). 'FastDelegate.h' is available from here. It depends on the scale of things. For the most part it's just a couple checks and a few pointer dereferences. In most implementations, at the top of every object that has virtual functions, there is a pointer to a vtable that holds a list of pointers to all the implementations of the virtual function on that class. I would guess that most implementations would use this to either store another pointer to the type_info structure for the class. // faked up way (this won't actually work, but gives an idea of what might be happening in some implementations). In general the real argument against RTTI is the unmaintainability of having to modify code everywhere every time you add a new derived class. Instead of switch statements everywhere, factor those into virtual functions. This moves all the code that is different between classes into the classes themselves, so that a new derivation just needs to override all the virtual functions to become a fully functioning class. If you've ever had to hunt through a large code base for every time someone checks the type of a class and does something different, you'll quickly learn to stay away from that style of programming. If your compiler lets you totally turn off RTTI, the final resulting code size savings can be significant though, with such a small RAM space. The compiler needs to generate a type_info structure for every single class with a virtual function. If you turn off RTTI, all these structures do not need to be included in the executable image. Well, the profiler never lies. Since I have a pretty stable hierarchy of 18-20 types that is not changing very much, I wondered if just using a simple enum'd member would do the trick and avoid the purportedly "high" cost of RTTI. I was skeptical if RTTI was in fact more expensive than just the if statement it introduces. Boy oh boy, is it. It turns out that RTTI is expensive, much more expensive than an equivalent if statement or a simple switch on a primitive variable in C++. So S.Lott's answer is not completely correct, there is extra cost for RTTI, and it's not due to just having an if statement in the mix. It's due to that RTTI is very expensive. This test was done on the Apple LLVM 5.0 compiler, with stock optimizations turned on (default release mode settings). So, I have below 2 functions, each of which figures out the concrete type of an object either via 1) RTTI or 2) a simple switch. It does so 50,000,000 times. Without further ado, I present to you the relative runtimes for 50,000,000 runs. That's right, the dynamicCasts took 94% of runtime. While the regularSwitch block only took 3.3%. Long story short: If you can afford the energy to hook-in an enum'd type as I did below, I'd probably recommend it, if you need to do RTTI and performance is paramount. It only takes setting the member once (make sure to get it via all constructors), and be sure to never write it afterward. That said, doing this should not mess up your OOP practices.. it's only meant to be used when type information simply isn't available and you find yourself cornered into using RTTI. typeTag=TypeAnimal; // start just base Animal. Standard RTTI is expensive because it relies on doing a underlying string compare and thus the speed of RTTI can vary depending on the class name length. For me the difference is roughly 15 times on unoptimized MS VS 2005 C++ SP1. For a simple check, RTTI can be as cheap as a pointer comparison. For inheritance checking, it can be as expensive as a strcmp for every type in an inheritance tree if you are dynamic_cast-ing from the top to the bottom in one implementation out there. You can also reduce the overhead by not using dynamic_cast and instead checking the type explicitly via &typeid(...)==&typeid(type). While that doesn't necessarily work for .dlls or other dynamically loaded code, it can be quite fast for things that are statically linked. Although at that point it's like using a switch statement, so there you go. It's always best to measure things. In the following code, under g++, the use of hand coded type identification seems to be about three times faster than RTTI. I'm sure that a more realistic hand coded implementtaion using strings instead of chars would be slower, bringing the timings close together..
A while ago I measured the time costs for RTTI in the specific cases of MSVC and GCC for a 3ghz PowerPC. In the tests I ran (a fairly large C++ app with a deep class tree), each dynamic_cast<> cost between 0.8μs and 2μs, depending on whether it hit or missed. So, just how expensive is RTTI? That depends entirely on the compiler you're using. I understand that some use string comparisons, and others use real algorithms. Your only hope is to write a sample program and see what your compiler does (or at least determine how much time it takes to execute a million dynamic_casts or a million typeids). RTTI can be cheap and doesn't necessarly need a strcmp. The compiler limits the test to perform the actual hierarchy, in reverse order. So if you have a class C that is a child of class B which is a child of class A, dynamic_cast from a A* ptr to a C* ptr imply only one pointer comparison and not two (BTW, only the vptr table pointer is compared). The test is like "if (vptr_of_obj == vptr_of_C) return (C*)obj"
How does the compiler know of to optimize this at compile time ? At compile time, the compiler knows the current hierarchy of objects, so it refuse to compile different type hierarchy dynamic_casting. Then it just has to handle the hierarchy depth, and add the invert amount of tests to match such depth. RTTI can be "expensive" because you've added an if-statement every single time you do the RTTI comparison. In deeply nested iterations, this can be pricey. In something that never gets executed in a loop it's essentially free. The choice is to use proper polymorphic design, eliminating the if-statement. In deeply nested loops, this is essential for performance. Otherwise, it doesn't matter very much. RTTI is also expensive because it can obscure the subclass hierarchy (if there even is one). It can have the side-effect of removing the "object oriented" from "object oriented programming". Not the answer you're looking for? Browse other questions tagged c++ performance rtti or ask your own question. What are some 'good use' examples of dynamic casting? How expensive are dynamic casts in C++? How to implement collision effects in a game? What significant exceptions are there to the zero overhead principle, if any? What Type of Cast to Go from Parent to Child? What's the advantages of turning off RTTI from compiler setting? How to check if an object is derived from specific class at runtime? Why does dynamic cast from class to subclass requires the class to be polymorphic?